This aircraft was seen by Edward Horgan at Shannon airport on Sunday afternoon at 2.30 pm. It took off about two hours later. 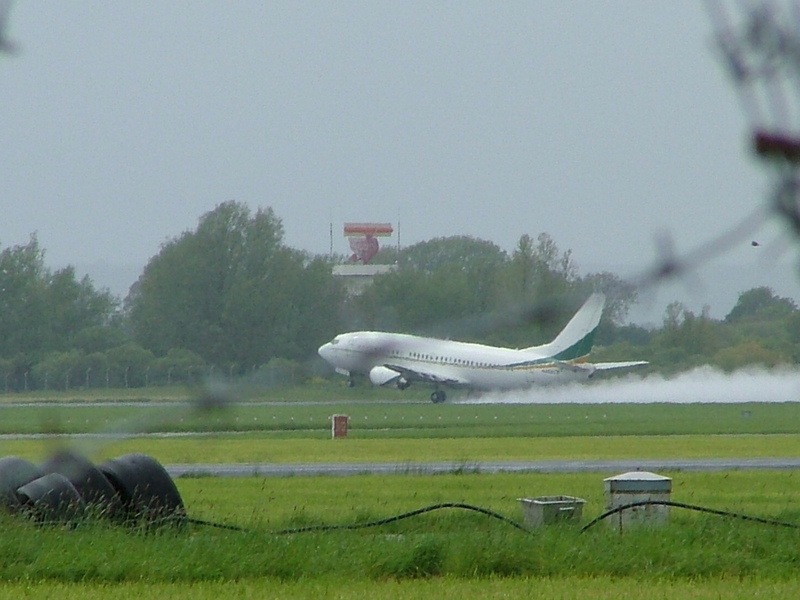 Connor Cregan got some photos of the take off which will be published later. 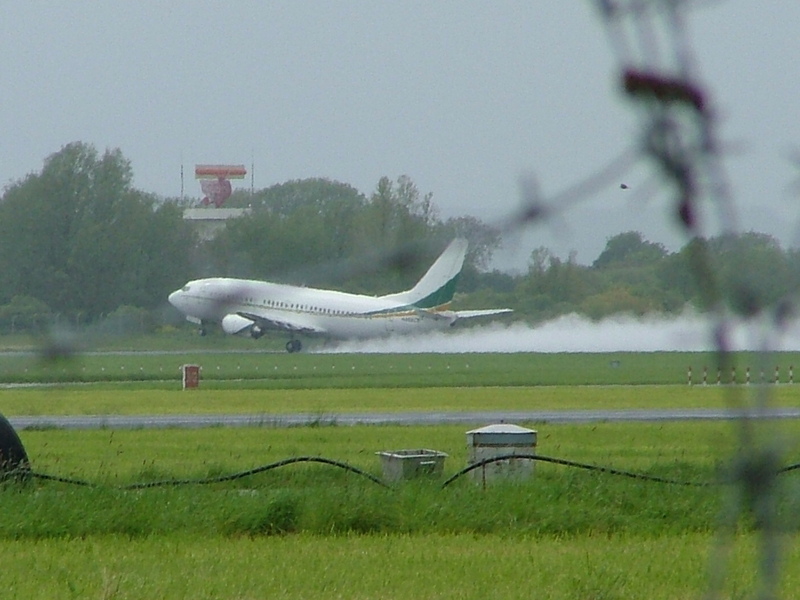 It has been seen regularly at Frankfurt in Germany. It is not yet clear whether it is controlled by the US Airforce or by the CIA. It is unusual for US Airforce to operate such unmaked planes. The Irish green white and gold colour scheme is a new innovation. It makes a change from World Airways flying in Aer Lingus colours. This report by Wayne Madsen shows it is not on its first visit to Shannon. Detailed flight logs of this plane will make interesting reading when we get them soon. Its previous stopping points include, Guantanamo, Baghdad, Kabul, Shannon and many of the usual suspect airports. One of the values of indymedia is to record what may appear to be trivial information like Tim recording N379P at Shannon in Jan 2003, even though we did not know what it was doing there. Likewise with the colour scheme of N368CE and its Co Clare CE numberplate. It will stick in people's memory. Are there some people suggesting that this plane was painted in its colour scheme purely to get through Shannon without being noticed and possibly mistaken for an Irish aircraft? Dispite all the places in the world its been do people really think they would go through all this trouble to get true Ireland. 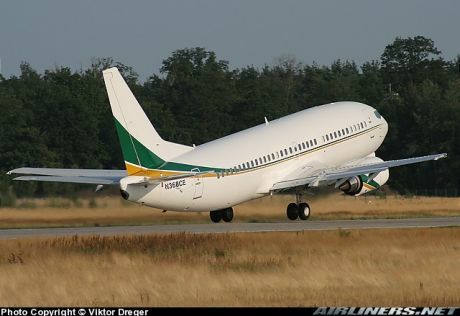 I've seen pictures of the plane and the last thing the green and gold stripe down the fuselage would have made think is, "Oh that must be an Irish plane". Imagination is running a bit too wild with some people. Wow, people are grasping at straws. Why would one think that Green, White & Gold are irish colours? Green, maybe but then again, Nigeria is also associated with green, as is Libya. It is the traditional colour of Islam. Maybe the Green party is organising the flights??? or maybe Little Green Men??? See Aviation Photo Search Engine. Enter registration number in the keywords field. Just click the button to open a form to send a message to Viktor Dreger. Bush: "Sorry to Oil the Torture Chambers and The Death Squads but Oil comes First. Fill her up ?????" Looks like Australian colours! You will be able to recognise them at the World Cup. One could add that your football team is as spineless as your politicians that's why you won't see Irish colours in Germany 2006. The Australian team is a testament to multi-culturalism, (as distinct from teh Australian government) ease up on your xenophobia and Ireland might qualify next time. The three photos shown above were taken by Conor as N368CE was taking off from Shannon. The highlighting of the colours is simply to help achieve recognition for future visits. Even your negative comments help to achive this. There are far too peace activists monitoring Shannon airport. We need far more of those who are having very useful strategy meetings in Dublin to also pay regular visits to Shannon and record what is going on, and also to carry out internet research into planes such as N368CE. 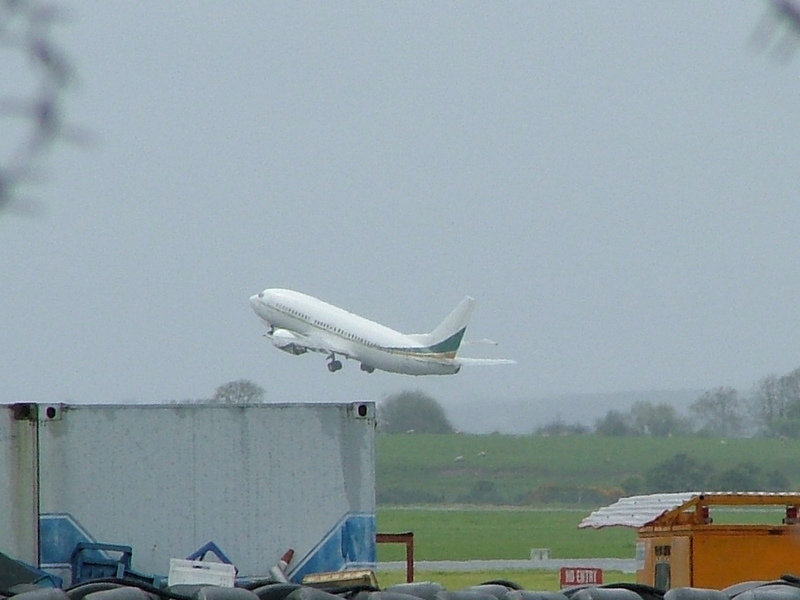 We do not yet know what was on board this aircraft at Shannon last Sunday, or what its previous or next stops were. We do know that it was connected with torture in the past and with attempts to subvert governments in Latin America. George Bush has decided to close down Guantanamo some year soon. That would be good news if we knew where the prisoners in Guantanamo were going to and how they will be treated. The likelihood is that most of them will be "repatriated" to the home countries, such as Saudi Arabia, Jordan, Egypt, and Afghanistan, where they will be imprisoned, tortured and in some cases exterminated. Kabul in Afghanistan has been just one of the landing points of this aircraft. We now need to be aware that planes such as N368CE are likely to be used to for these further torture renditions. Now is a good time also to express our solidarity with the Afghan hungerstrikers in St Partick's Cathedral in Dublin. Many of them are facing deportation to a country destroyed, first by the British Empire, then by the USSR, and now by the US-led coaltion of the complicit. Brutal Afghan regimes added to the pain and torture suffered by virtually all Afghan people. Call to St Patrick's and offer your solidarity. Bush: "GOT OIL???? Then I'll be seeing you soon. When I come to Kill you and take your Oil !!!!!" There were questions asked in Westminister about this plane. when I saw that plane.for it to be anyway recogniseable as an Irish aircraft,it has to have two or one national symbols.Either a Harp or Shamrock.. I'm sure the dumb warmongering CIAwould know that too,and spend a few quid painting one on it to really confound the hairy plane spotters.